While much of the media conversation has focused on the departure of Jay Leno from The Tonight Show‘s hosting desk despite his being the top dog among the broadcast networks’ late-night programming, cable net Comedy Central is touting a lesser-known fact: both Jon Stewart‘s Daily Show and Stephen Colbert‘s Colbert Report are beating them all in a particularly young demo. “They’re all fighting for third place now,” reads the Comedy Central ratings release. Of course, they aren’t talking about total viewership or the widely-used 25-54 demographic. Rather, they are using the much younger 18-49 demo as proof that they are dominating the broadcast competitors. While NBC, CBS, and ABC contest the use of that demo for ratings comparisons, it’s true: Colbert’s late-night faux-news show just beat The Tonight Show in the 18-49 demo for a full quarter, 1.3M versus Leno’s 800k demo viewers. The Daily Show ranks #1 overall in the same demo, averaging 1.3M in the 18-49 demo for this first quarter of 2013. 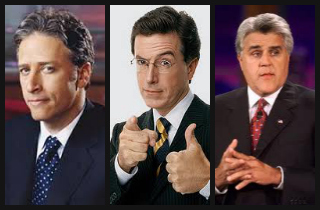 With both of them now beating Leno — the top-rated broadcast late-night show — in that key 18-49 demo, some are asking whether Colbert or Stewart could eventually transition onto the broadcast networks.